Last weekend I managed to not over-schedule our Sunday, which meant that my evening was free to make another tasty meal. Mike’s vote was fajitas so I went to work finding the perfect inspiration. As soon as I found a recipe that called for tequila, I knew we had a winner! The following recipe started with inspiration from a couple of Rachael Ray and Pat and Gina Neely recipes, but of course I had to “Taylor” it. Enjoy! 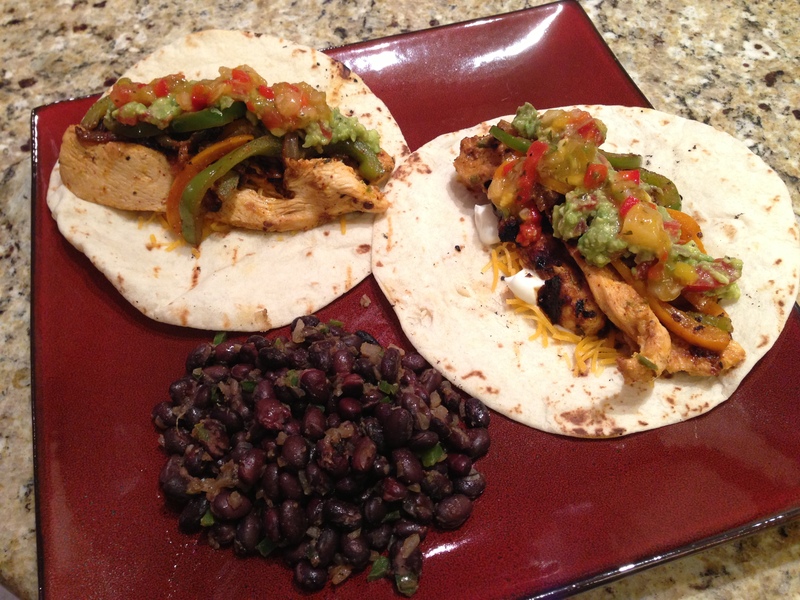 Chicken Fajitas with a spicy tequila twist! Try these with my Black Magic Beans! Using tongs, pick the chicken strips out of the marinade and cook for about 3-5 minutes on each side. This all depends on how thick the chicken is. The sliced peppers and onions can just be sauteed in a pan over medium heat. Personally, I like my onions caramelized, so I usually start them low and slow with some EVOO before turning up the heat and adding Mike's veggies for a few minutes. For some additional flavor, you can pour in some of the marinade right when you add the peppers and onions to the pan. If you do this, cook over medium-high heat to bring the liquid to a boil so you can kill all of the chicken germies. Build your fajita to your liking - peppers, onions, chicken, cheese, sour cream, salsa, etc. One little trick I like is to schmear a little sour cream directly onto the tortilla. I like this better than mounding it on top of everything because you get a nice even bite. I then layer the cheese over the sour cream - I get an even layer, it doesn't fall off, and it tends to melt better under the warmth of the meat and veggies. Chipotle in adobo is canned and can be found in the Hispanic food section of just about any grocery store. I transfer it from the can to a small plastic container that lives in my freezer. It’s super easy to slice off a chunk any time it’s needed in a recipe and then none of it goes to waste!